Remove any strings from the edges of the long/green beans and top and tail them. Break them into short sections (about 5cm long). Heat 1 ½ Tbsp of oil in a wok over a low to medium heat. 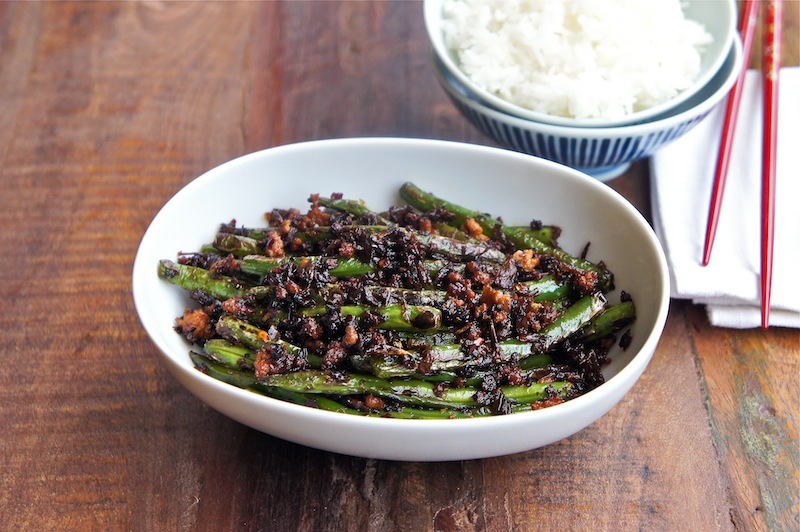 Add the long/green beans and stir-fry over a medium heat for about 6 minutes, or until they are cooked and tender, with slightly puckered skins. Remove and set aside. Heat 2 Tbsp of oil in the wok over a high heat. The add the Ya Chai, ground pork, dark soy sauce, chili oil with sediment, and stir-fry until the meat are cooked and fragrant. Toss in the beans and stir and toss the ingredients together, adding pepper and sea salt to taste. Serve immediately. These sound so yummy! Great recipe. I love green beans! These sound so tasty. I'm going to check for sichuan preserved vegetables next time I'm at the Asian supermarket. I love new ingredients! I can see me eating extra rice already! i love green beans. I'll definitely have to try this recipe soon. Looks great! mmmmm.....too bad I'm allergic to pork. I guess ground chicken, diced mushrooms or vegetarian ground beef substitute could work! The green beans look great. these look so much more interesting than a traditional mess of green beans. thanks for sharing! Great recipe, will have to try this with my next bunch of green beans rather than tossing them into a normal stir fry. Thank you. Yummy! Now I know that to do with my pack of french beans. That's a very interesting recipe. Just spicy enough.